An inforgraphic on 10 Corporations that Control Almost Everything we Buy. 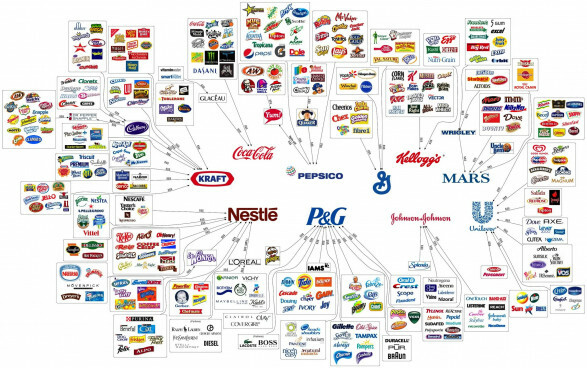 Some of them are Nestle, Unilever, Coco-cola, Pepsico, Mars, Kraft & others. Bitcoin has taken the world by storm. On Mt.Gox, the Tokyo based Digital exchange, the bitocin has touched $1000. in the last few months, bitcoin has become a topic of conversation on the internet with economists, neitizens, shoppers, ecommerce sites & others fuelling the debate on it. It is not issused by any central bank nor monitored by them. It has become a new global currency. Many are also warning a bitcoin bubble with the bitcoin touching $1000 mark. Bitcoin Black Friday is a holiday shopping festival just for Bitcoin users. On November 29th, hundreds of merchants will offer special deals to anyone paying in Bitcoin. You can buy reddit gold, unlocked phones, air tickets & others. Google India’s latest ad titled “Google Search: Reunion” has sparked a great deal of conversation on social media & other media outlets. This is based on the partition of India & Pakistan where 2 friends meet after a long time thanks to Google search. Advertisements based on India/Pakistan partition evokes emotional response & many brands are using this theme for their ads. Coco-Cola had an advt featuring vending machines where people from 2 countries can meet online. Google has a high search market share in India & still has gone created this lengthy advt. With users shifting towards mobile search & apps, Google wants to capture this shift towards search. In the advt, search starts from Desktop search & moves on to mobile search. The Digital Life of American Teens on Snapchat, Tumblr, Youtube, Vine, Games, Instagram, Twitter & others. The Web Index is a measure of the world wide web’s contribution to development and human rights globally. It is designed & produced by the World Wide Web Foundation. The index measures & ranks Universal Access, Freedom and Openness, Relevant Content & Empowerment. The index was released in 2012 & in 2013 has been expanded to include 20 new countries. Both secondary data a& new primary data has been used to build the index. It is not just how many internet users a country has, the penetration index, broadband speed & others which are important but also how the web impacts social, developmental, economic and political dimensions as well. This can be utilized by the NGO’s, Govt, think tanks & others to how to better use the web for overall development. India has been ranked 56 out of 81 countries in the annual Web Index. Sweden, Norway, UK & USA are in the top 4 positions. Candy Crush Saga has surpassed 500 million downloads & has been played billions of times. Clever marketing strageties of easy game, simple design, colors & availability of game across many platforms have aided for the growth of game. It made its debut on Facebook, followed by iOS & Android. Game has an in market app which could be used playing the games. With just 1 level, several hundred levels have been added to the game. Candy Crush Facebook page has millions of likes & many post their opinions of the game on the page. Helping Women Get Online(hwgo.com) is an initiative by Google in India to empower women by enabling them to use the internet. In India, only 30% of the active Internet users are women. By bringing more women online, it would empower them & also improves society. Google’s Plan is to have 50 million additional women get online by end of 2014. Intel, HUL, Future Group & Axis Bank are the other partners in this effort who will help drive this initiative through various efforts. Some of the other partners in this effort are Johnson & Johnson, indiatimes, Healthkart & Babyoye. An Internet Toll Free Helpline number has also been set up at 1800 41 999 77 to guide women if they get stuck on the Internet.The site has information on all the basics like internet skills, chat/email & videos online. Cooking tips, Financial tips & Household tips are also available on the site. The site is also available in Hindi.